The Tanque Verde Ridge trail is located in the Rincon Mountain Division of Saguaro National Park in Tucson, Arizona. The trail begins at the Javelina Picnic Area where it quickly begins a most scenic climb that leads it up Tanque Verde Ridge. 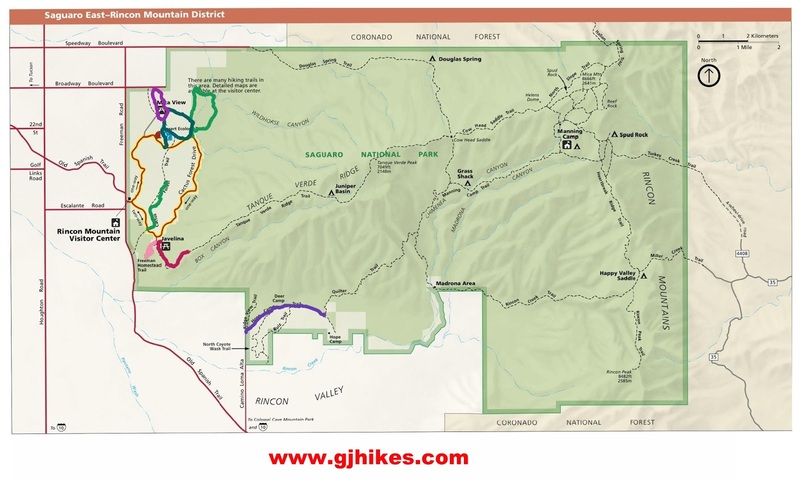 Although this post only follows the trail for its first mile and a half it can be continued all the way up to Tanque Verde Peak (7,049 feet). 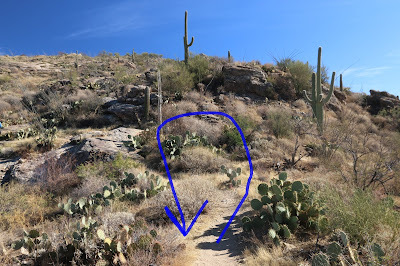 The Tanque Verde Ridge trail is connected to by several other trails that open up various backpacking opportunities in Saguaro National Park and the Rincon Mountains. To get to the trailhead find your way to the Rincon Mountain Visitor Center and follow the road around to the Javelina Picnic Area. The trail begins near the southwest corner of the picnic area at a well marked trailhead. The well traveled trail is easy to pick out of the surrounding desert landscape making route finding an easy task. There are a few short spur trails that mostly lead to overlooks. After crossing a small rise the trail makes a little dip and then begins a continual climb. Outcrops of metamorphic rock add a little unevenness to the hard surface of the trail. The incredible scenery makes it easy to see why the area was made into a National Park. As the trail climbs the ridge there are an occasional side trail that lead to overlooks where hikers can take in views of the Tucson Basin and surrounding area. The sign at the trailhead mentions that the trail is steep. For the short distance that we hiked we found a few very short segments of trail that were steep but felt for the most part the grade to be moderate. We are accustomed to slopes that have grades over 25 degrees so it is all whatever you are used to. The turnaround point for this hike was just past the 1.5 mile point. It would have been nice to go further but we made the hike on Christmas day and with dinner and all we only had a couple of hours to spare. The Javelina Picnic Area has quite a few sheltered picnic tables that include grills as well as a restroom nearby. Tanque Verde Ridge is a nice trail to see some incredible scenery and enjoy great views of Saguaro National Park and the Tucson area. The trail is long enough to satisfy anyone that is looking for a good workout. Whether you hike only to the 1 mile point where the first overlooks start appearing or continue much higher up the ridge you will have the opportunity to enjoy one of Saguaro National Parks best trails. If you would like to see it for yourself then all you have to do is 'Take a hike'.